The material here is excerpted from Attack of the 50 Foot Demon, a CD-ROM by Larry Moss. More information about the CD, including ordering information is available online. What is a balloon fabric? Background information on terms stolen from the fabric industry. 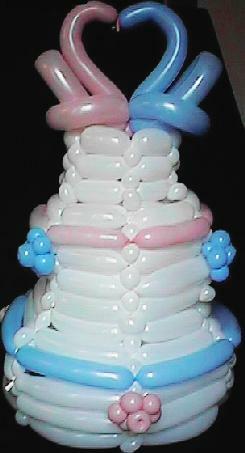 Making balloon braids A simple beginning. 2-D circular fabrics The most common "weaving" technique. 3-D shapes based on circular fabrics Modifying what you already know. Tubular fabrics A faster technique for very large tubes. Flat objects A special case of circular and spiral techniques. Tiling balloons Using hearts for balloon fabrics. Stuffing balloons in frameworks An interesting way to create texture quickly. A large scale example combining all of the techniques discussed here, and a few others not yet written up. 15,000 balloons were used in this project. Balloon fabric guide by Larry Moss. This guide and the support material, including all of the examples found here and quite a bit more , is available on the CD-ROM, "Attack of the 50 Foot Demon". The video clips found on the CD-ROM are larger and more clear than that found on this site. For more information about the CD, check this out. Note: Special thanks to Mark Balzer for doing the background research used in the terms section.